I love to entertain and if money was no object I would love to fly my friends on a private jet to France just to have dinner! Doesn't it sound wonderful? Indeed it is a pretty crazy idea but unfortunately I can not fulfill that dream... So instead my friends will be treated to French Bistro food with me behind the stove cooking up a storm. It might not be as adventurous as flying to France at a moment notice but what I can offer is a great dinning experience where the food will be prepared with love! Which is Priceless, right? "There is no denying that we all love fancy food but once in a while it is nice to go back to basics just like Phuc did! Basic for Phuc is great steaks, basic for me is Bistro food! On the menu there will be traditional comforting bistro fare with humble cuts, fresh regional ingredients, cooked slowly with love and attention, and meant to be shared humbly between family and friends and that is what bistro food is all about! Well, at least that is the definition of bistro food! Entertain and simple? Nah… that’s not me! 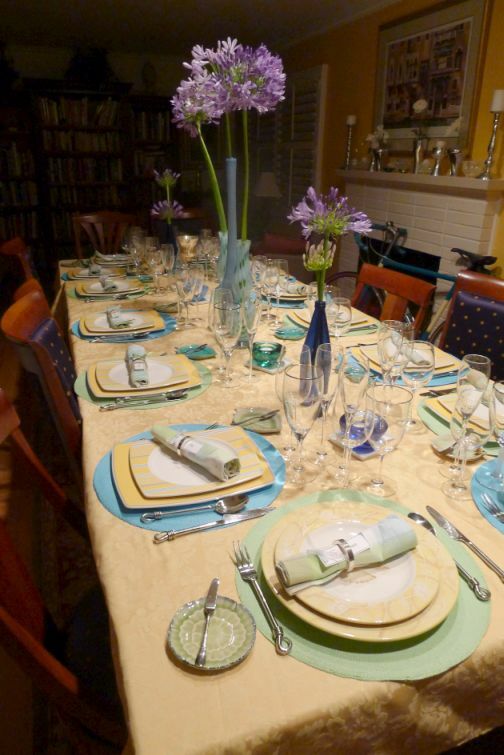 I have yet to master the art of simple entertaining so in order to continue my stride…. as usual, I’ll have to kick it up a notch! The food might not be so humble after all but it will be definitely traditional French food. How would I transform humble food up a notch? Simply by using Thomas Keller’s recipes from his “Bouchon” cookbook! Come with an empty stomach, bring your appetite and ready to enjoy the food!" Okay, now that the e-mail was set out to my friends, they will be expecting to be transported to France for the evening! Let's get to work with setting up the table. The concept for my table was simple, I wanted to set up the dinning table reflecting bold colors under the bright Provencal sun. 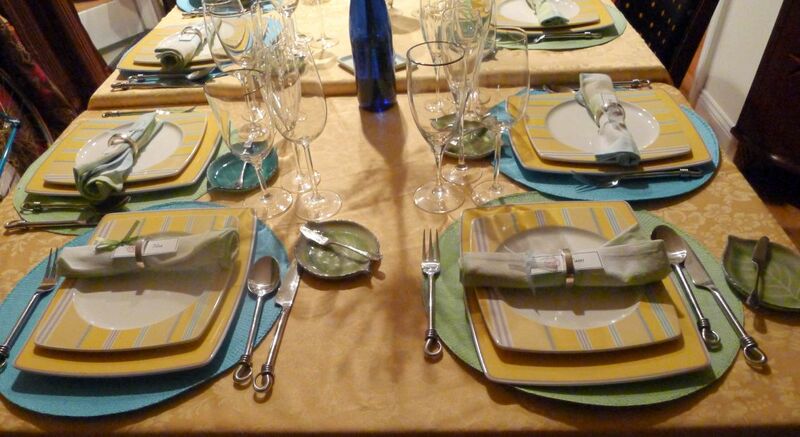 Imagine the deep purple of lavender fields to the radiant yellow of sunflowers and that's the inspiration for the tablescape by using yellow and blue. 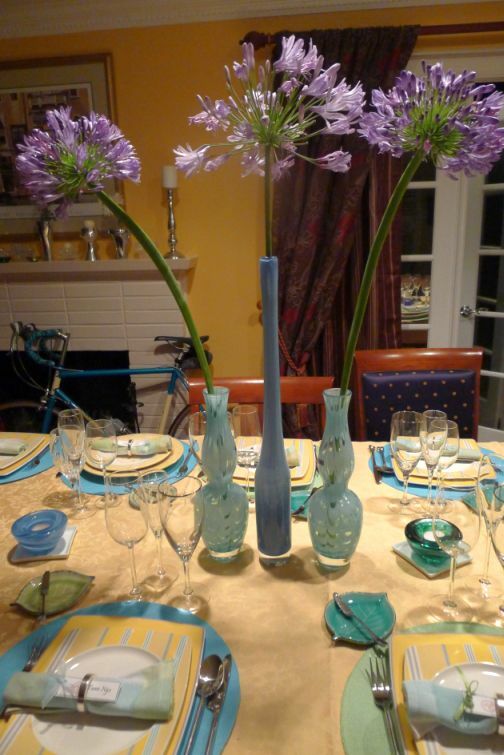 I created centerpieces for focal point, added blue straw mat for a bust of color against the yellow tablecloth. 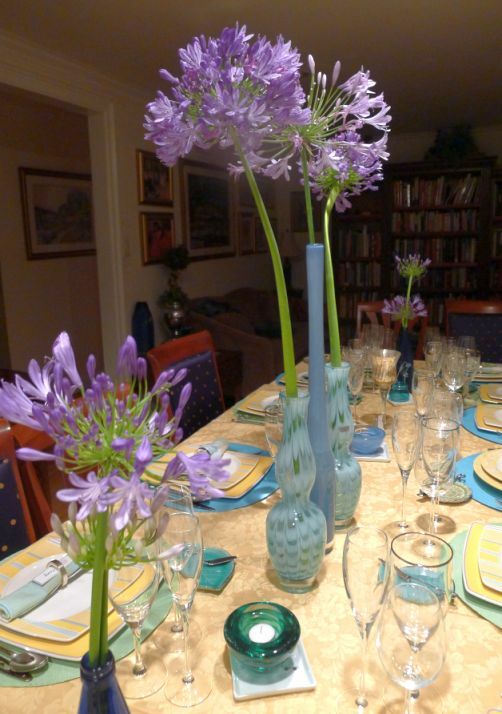 As centerpieces I choose 3 tall blue vases with different heights and filled them with Blue Agapanthus flowers from our garden. 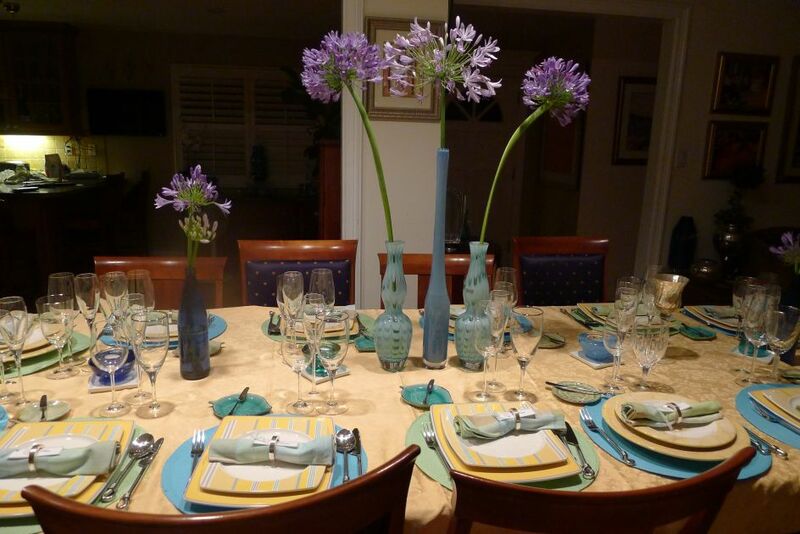 Tall centerpieces look elegant and bring height to create a bit of drama and wow factor. This picture was taken when I am just testing how the set up looks by using the yellow tablecloth against the color of the straw mat and plates! I have to say I like it so I am moving forward with it. View of each individual plate setting complete with napkins and individual name tag. 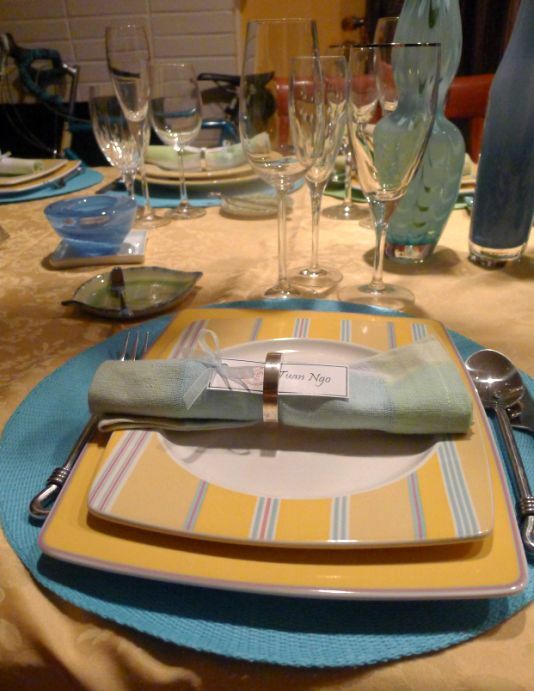 The yellow plates with blue stripes are perfect for this occasion! 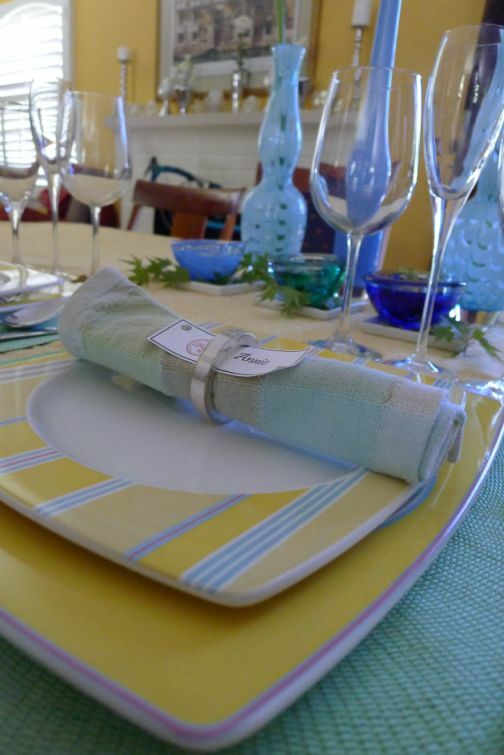 Layering a blue straw mat underneath each plate make it bright and sunny just like Provence suppose to be. 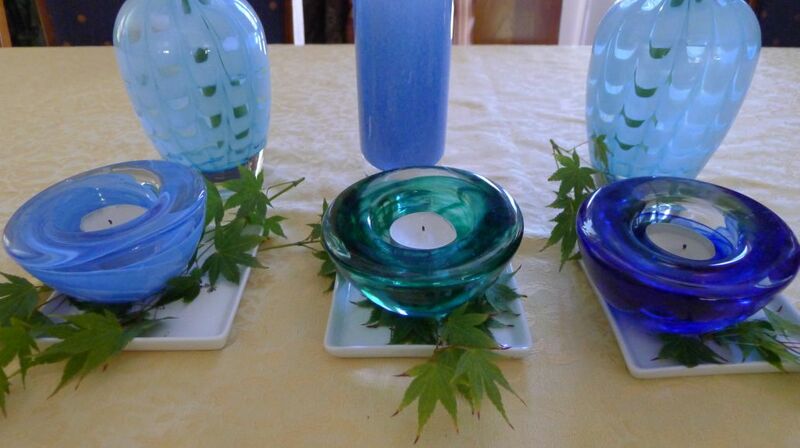 Adding maple leaves under each plates and adding candles holders on top. I like how the colors are coming together. 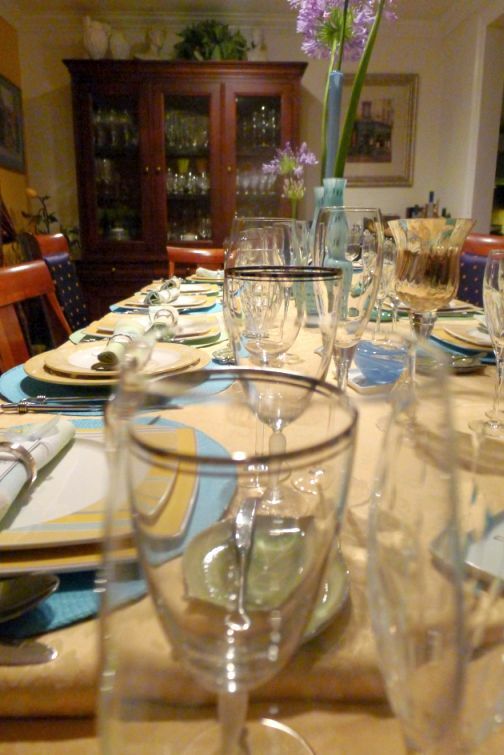 Partial view of table with the wine glasses. View of the end of the table! I had 15 people over for dinner so I have use every single inches of the table. 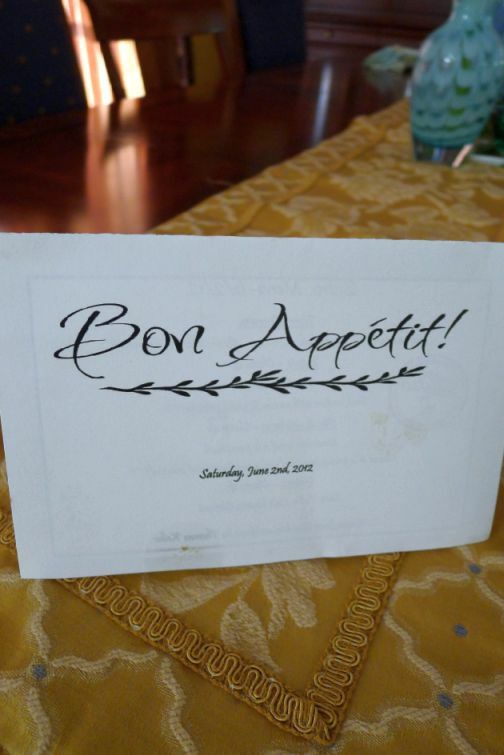 Since I want our guests to feel that they are dinning at a restaurant in France I create a special menu for the evening. 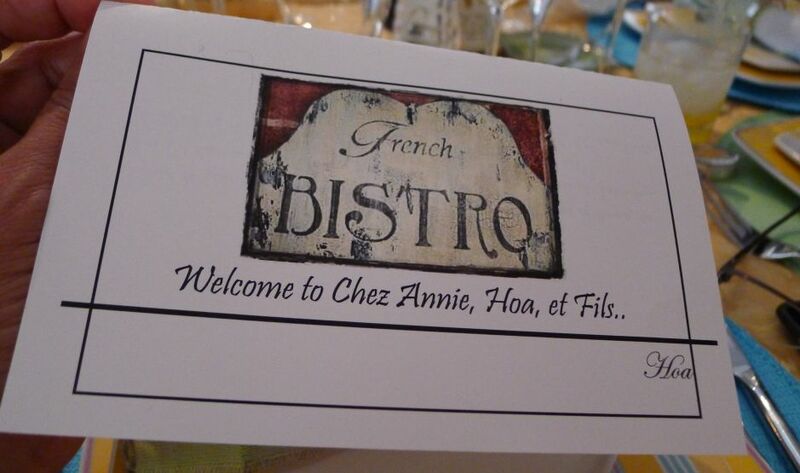 Welcome to Chez Annie, Hoa, et Fils (and sons). I added "et fils" at the end because a lot of small bistro restaurants are Moms and pops so here the addition of the word: "et fils", fits in the scheme. 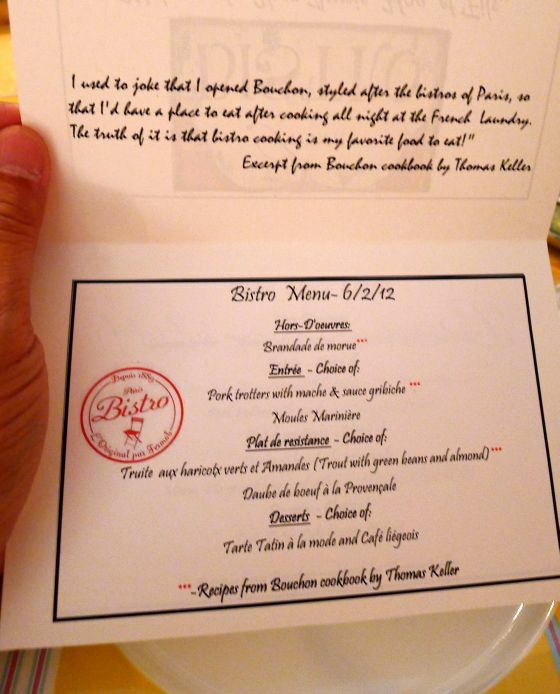 The menu with a short excerpt from Thomas Keller on top.